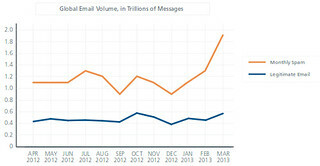 McAfee Labs today released the McAfee Threats Report: First Quarter 2013, which reported a significant spike in instances of the Koobface social networking worm and a dramatic increase in spam. McAfee Labs also saw continued increases in the number and complexity of targeted threats, including information-gathering Trojans and threats targeting systems’ master boot records (MBRs). This entry was posted in Botnets, Identity Theft, Information risk, IT Securiiy, IT Security, Measurement, Research, Security, spam and tagged advanced persistent threats, Android, APTs, boot records, cybercrime, ecrime, email, facebook, John S. Quarterman, Koobface, malware, MBR, McAfee, signed, spam, threats, trojans, twitter, virus, worms on June 4, 2013 by John S. Quarterman. John S. Quarterman, long time Internet denizen, wrote one of the seminal books about networking prior to the commercialization of the Internet. He co-founded the first Internet consulting firm in Texas (TIC) in 1986, and co-founded one of the first ISPs in Austin (Zilker Internet Park, since sold to Jump Point). He was a founder of TISPA, the Texas ISP Association. Quarterman was born and raised in Lowndes County, where he married his wife Gretchen. They live on the same land where he grew up, and participate in local community and government. Quarterman took some time during Georgia River Network's Weekend for Rivers to speak with the Nonprofit Snapshot about spam-mapping and small town politics. More about Elinor Ostrom's Nobel-prize-winning work on organizing the commons, and how that applies to SpamRankings.net. This entry was posted in Business, Culture, Distributed Participation, Diversity, Ecology, Economics, Emotion, Forensics, Forestry, Government, IIAR, Information risk, Infrastructure, Intenret coordination, Internet risk management strategies, IT Security, Law, Liberty, Management, Marketing, Measurement, Performance, Politics, Prevention, Processes, Reputation Systems, Research, Science, spam, SpamRankings.net, Transparency, VoIP and tagged Alapaha, Business, commons, Culture, Distributed Participation, Diversity, Ecology, Economics, Elinor Ostrom, Emotion, Forensics, Forestry, Georgia River Network, Government, IIAR, Information risk, Infrastructure, Intenret coordination, Internet risk management strategies, IT Security, John S. Quarterman, Law, Liberty, Little River, Management, Marketing, Measurement, north Florida, peer influence, Performance, Politics, Prevention, Processes, rankings, Reputation Systems, Research, riverkeeper, Science, south Georgia, spam, Spam ranked as a sneeze for infosec disease, SpamRankings.net, Transparency, VoIP, watershed, Weekend for Rivers, Willacoochee, Withlacoochee, WWALS on August 24, 2012 by John S. Quarterman. This entry was posted in Availability, Crime, Data Mining, Distributed Participation, Diversity, Economics, financial services, Forensics, Government, Identity Theft, Information risk, Intenret coordination, Internet risk management strategies, IT Security, Law, Management, Marketing, Measurement, Prevention, Processes, Reputation Systems, Research, Security and tagged Availability, Crime, Data Mining, Distributed Participation, Diversity, Economics, financial services, Forensics, Government, Identity Theft, Information risk, Intenret coordination, Internet risk management strategies, IT Security, Law, Management, Marketing, Measurement, Prevention, Processes, Research, Security on April 19, 2012 by John S. Quarterman. 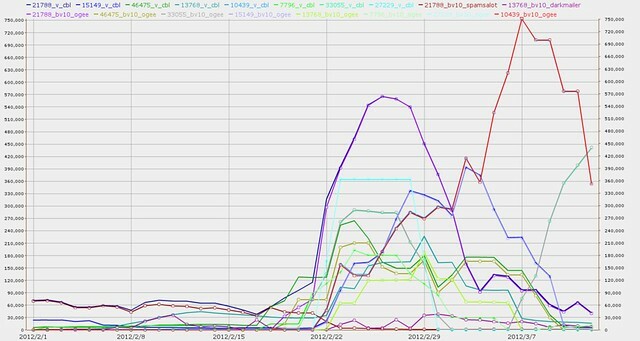 What other ASNs were affected by botnet Ogee in February 2012? Previously we determined that nine ASNs that showed spam surges in the U.S. and Canadian top 10 SpamRankings.net for February 2012 were infested by the botnet Ogee and that spam came from that botnet. What other ASNs were affected by Ogee in the same time period? It looks like Ogee is a new botnet, since all these top 10 ASNs came up from zero volume before 18 February 2012. The biggest initial peak in this graph is from AS 21788 NOC, #1 in the U.S. February top 10, and the biggest late surge is from AS 10439 CARINET, #8 in that same ranking. Right below CARINET is AS 32613 IWEB-AS, Canadian February #1. The rest of the 8 Ogee-infested from the U.S. top 10 previously described also are in there, except AS 7796 ATMLINK and AS 13768 PEER1. This entry was posted in Botnets, Forensics, IIAR, Information risk, Infrastructure, Intenret coordination, Internet risk management strategies, IT Securiiy, Measurement, Performance, Prevention, Reputation Systems, Research, Snowshoe, SpamRankings.net and tagged ASN, Autonomous System, blocklist, botnet, CBL, exploit, IIAR, infection, infested, Ogee, Security, spam, SpamRankings.net, vulnerability on March 13, 2012 by John S. Quarterman. 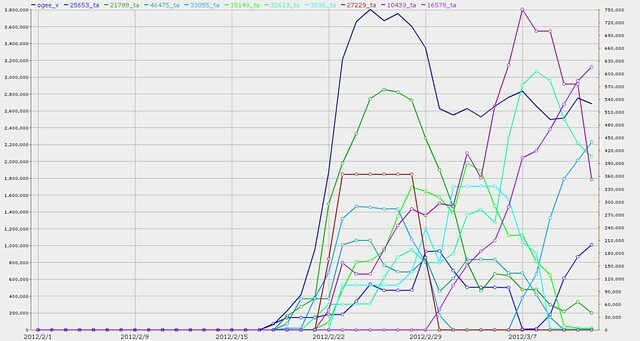 Did the February 2012 spam surge come from one botnet? a huge surge in spam from some U.S. ASNs, mostly from ones that hadn’t even been in the top 10 before, with possible correlations in one ASN each from Peru and Canada. Did all this spam come from the same botnet? The chart also shows some ASNs reacted quickly and stopped the spamming, while others got worse. It’s a busy chart, so let’s look at simpler charts for one example each of resilient and susceptible ASNs. This entry was posted in Botnets, Data Mining, Forensics, IIAR, Information risk, Infrastructure, Intenret coordination, Internet risk management strategies, IT Securiiy, Measurement, Reputation Systems, Research, Snowshoe, SpamRankings.net and tagged ASN, Autonomous System, blocklist, botnet, CBL, exploit, IIAR, infection, infested, Ogee, Security, spam, SpamRankings.net, vulnerability on March 12, 2012 by John S. Quarterman. What could push the U.S. from 13 to 2 in worldwide SpamRankings.net, and way up to number one for the last week of February 2012? In the U.S. rankings by ASN, seven out of ten are new, and NOC number 1 came up from number 9. Something pretty bad is going on. So bad Comcast didn’t place in the top 10 at all, for the first time in recent memory! NOC has had this problem before, in July and November 2011, but never with this amount of spam volume. And this time many other ASNs show the same pattern. The same issue may be in the Canadian rankings as well: AS 32613 IWEB-AS jumped from 8 to 1 for the month, with almost all the increase in the same last week of the month as for the U.S. problem ASNs. There was even a similar curve in the World rankings, for Telefonica del Peru’s AS 6147 SAA. Our next step is to drill down to see if these ASNs were infected by the same botnet. We did that for the medical ASNs last month, but this is a much bigger spam event this month. This entry was posted in IIAR, Information risk, Intenret coordination, IT Securiiy, Measurement, Performance, Prevention, Reputation Systems, Research, Security, Snowshoe, spam, SpamRankings.net and tagged botnet, IIAR, peer rankings, ranking, reputation, spam, SpamRankings.net on March 8, 2012 by John S. Quarterman. Cyber attacks made the Davos Top 5 Global Risks in Terms of Likelihood. Davos, the annual conclave of the hyper-rich and famously elected, has also discovered Severe income disparity and Water supply crisis, so maybe they’re becoming more realistic. However, in Figure 17 on page 25 they’ve got Cyber attacks as an origin risk, along with Massive incident of data fraud or theft and Massive digital misinformation. I think they’re missing the point, which is the real origin risk is poor infosec, and the origin of that is vendors like MSFT knowingly shipping systems with design flaws and people and organizations running them while hiding such problems. This entry was posted in Breach reporting, Catastrophe, Climate Risk, Diversity, Economics, Elections, Forensics, Government, Identity Theft, Information risk, Intenret coordination, Internet risk management strategies, IT Securiiy, Politics, Reputation Systems, Security, Transparency and tagged breach report, cooperation, cyber attack, Davos, disclosure, elected, famous, income inequality, infosec, Law, politician, reputation, rich, SEC, water security on February 17, 2012 by John S. Quarterman. Is January’s medical spam caused by botnets? Even though the three three-digit-spamming medicos spam oddly coherently, we don’t find any botnets for them. This may be because most of that spam was seen by PSBL, and our botnet assignments come from CBL. CBL didn’t see any spam from those ASNs, so it didn’t have anything to assign for botnets. Maybe they’re infested by the same botnet; maybe not; can’t tell. 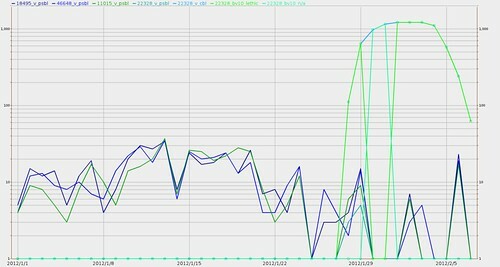 But it was CBL that saw that big spam spike for AS 22328 CSHS. And CBL did assign a botnet to that: Lethic. For all but two days of CSHS spam shown, CBL assigned Lethic to the total amount of spam from CSHS for that day. That may be because all that CSHS spam is coming from a single computer. Of course, CBL’s botnet assignments are not perfect, but infosec professionals tell me CBL is about as good as it gets for that, so there’s a good chance this botnet assignment is correct. The good news is that all of the trio of three-digit spamming medicos decreased their spam and even went to zero during the period shown. And CSHS spam peaked at the end of January and started back down in February. Pretty soon there may be once again little or no spam from medical organizations to rank. This entry was posted in Botnets, Forensics, IIAR, Information risk, Intenret coordination, Internet risk management strategies, IT Securiiy, Measurement, Reputation Systems, Research, spam, SpamRankings.net and tagged botnet, Cedars-Sinai Health Systems, CSHS, disease, Lethic, Medical, phishing, reputation system, Security, spam, SpamRankings.net on February 16, 2012 by John S. Quarterman. Cedars-Sinai Health Systems‘ AS 22328 CSHS came in only seventh in PSBL data, with only 10 spam messages. But in CBL data, CSHS came in first, with 2,873 messages. That’s not a lot, compared to, for example, Comcast, which CBL saw spamming more than two million messages during the same month. But what patients would prefer to see from medical organizations is zero spam messages, since spam is a sneeze for infosec disease, and who wants to think their hospital’s information security or radiology computers might be infected? Chances are CSHS will notice and clean it up pretty quick. Those other three medical orgs may have some sort of more chronic problem…. This entry was posted in Forensics, IIAR, Information risk, Internet risk management strategies, Measurement, Medical, Reputation Systems, Research, spam, SpamRankings.net and tagged botnet, disease, Medical, phishing, reputation system, Security, spam, SpamRankings.net on February 15, 2012 by John S. Quarterman. SEC moving towards breach disclosure requirement? Registrants may seek to mitigate damages from a cyber incident by providing customers with incentives to maintain the business relationship. Hm, incentives like showing an improved reputational risk ranking? Perhaps in order to prevent this sort of thing? Cyber incidents may also result in diminished future cash flows, thereby requiring consideration of impairment of certain assets including goodwill, customer-related intangible assets, trademarks, patents, capitalized software or other long-lived assets associated with hardware or software, and inventory. Registrants may incur substantial costs to prevent cyber incidents. Accounting for the capitalization of these costs is addressed by Accounting Standards Codification (ASC) 350-40, Internal-Use Software, to the extent that such costs are related to internal use software. Sure, infosec costs money. But if infosec actually prevents loss of customer goodwill, infosec could attract and retain customers, so infosec could be a source of profit. If anybody knows about it, that is. This entry was posted in Breach reporting, Economics, Information risk, Internet risk management strategies, Reputation Systems and tagged ASC, customer, cyber risk, goodwill, infosec, loss, profit, SEC, software on February 6, 2012 by John S. Quarterman.